Flashback: The Quest for Identity - Atari Jaguar. Condition is Very Good. Dispatched with Royal Mail 1st Class. Atari Jaguar Raiden 64-Bit Cartridge Video Game Boxed Tested Working. Box Condition is Good with some wear to edges. Atari Jaguar Doom 64-Bit Cartridge Video Game Boxed. Condition is Like New. Dispatched with Royal Mail 1st Class. 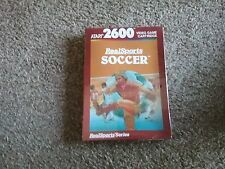 frostbite atari 2600 game only pre owned more on profile. Condition is Good. Dispatched with Royal Mail 1st Class Large Letter. Condition is Good. Actual title of it is Escape from Perilous. The L just looks like a C upon research. Asterix at the Olympic Games Nintendo DS game. Condition is Good. Also works on a 3DS. The game has been reset to factory settings. Dispatched with Royal Mail 2nd Class Large Letter. Asteroids for Atari 2600 VCS including manual (and, in a throwback to the confusing eighties, the manual for the 7800 as well). Atari 400 800 xl xe Spitfire Ace. Condition is Very Good. Tested and working on my 65xe. Dispatched with Royal Mail 2nd Class signature on delivery. Free postage for UK buyers only. ATARI 2600 BOXED - NIGHT DRIVER Condition is Acceptable. Dispatched with Royal Mail 1st Class. The Story So Far Inc Thundercats Atari St tested and working. And so, Jenga was born. Jenga on the DS, as you'd expect, is played with the touch screen and stylus. If you're the sort of Jenga player who likes to tap the blocks before they move them, fear not. GAUNTLET lets you and up to 3 friends combat waves of attacking monsters while competing for food, treasure and magic potions! If you are unsure what format your machine is, you can check by looking on the sticker that is located on the bottom or the side of your machine. Atari CX-2600 VCS Console, boxed with accessories. Adapter/connector to switch between TV and Console. All switches operate as expected. Instruction booklet. Didn't think so. Let Stuntman into your life. Career is the main mode and where you get your major jollies with Stuntman. You'll start out working on small budget films and work your way up to the big blockbuster movies, but only if you're very talented and have no fear. Yu Yu Hakusho Spirit Detective GameBoy Advance GBA Good Condition. Condition is Very Good. Slight creasing on front of box as per photo. Dispatched with Royal Mail 1st Class. Marc Ecko's Getting Up For Original Microsoft Xbox. Includes Instruction Manual. Platform : Playstation 2. Condition : Good. List Price (MSRP) : 34.99. Genre : Action. Release Date : 2005-09-16. Crystal Castles for Atari 2600 VCS. Games Each game separately tested Manual included : no Additionally items: Naruto Knives Condition of CD was classified as good / very good used ( it’s mean that CD’s may have some marks of used ) Please note that any activation, registration or bonus codes are untested Naruto: Ultimate Ninja Sony PlayStation 2 Game Atari. Condition is Like New. Dispatched with Royal Mail 2nd Class Large Letter. Also, both are first-person, stealthy shooters that involve both close-in and ranged combat styles. The Chronicles of Riddick: Assault on Dark Athena boasts 20 hours of play across the two campaigns as well as six online multiplayer modes to keep you busy. In MINT & Sealed condition. Commodore 64 / GS / Amiga / Vic 20. Atari VCS / 2600 / ST / 400 / 800 / XE / XL. Sinclair ZX Spectrum (with suitable interface). Our gradings refer to Sleeves, Inlays, Labels and 'Specific' Boxes and Cases. Conversational German. Full set of cassettes / Instructions. Jr. Pac-Man for Atari 2600 VCS, back when Namco decided Pac-Man needed an entire family. Atari 2600 Bridge By Activision. Condition is Good. Dispatched with Royal Mail 2nd Class.